I'm sure most of you watched this year's Superbowl game and were completely blown away, as was I, by Ram Truck's commercial saluting the farmer. Yvette shared the ad on Facebook before the football game was even over and the response was amazing. I posted the link on our blog. You all loved it. Ram Truck donated $1 million dollars to FFA. I figured that was the end of it. But to my sheer and utter amazement, several weeks later I was contacted by Ram Trucks and invited to write for their blog www.RamZone.com! Over the course of the coming year they will be featuring stories by real farmers....beginning with mine. I was absolutely thrilled to have been invited to write an essay for them. Here it is. I hope you enjoy it. That's a lovely essay. Thank you. Wow! That is awesome! Congratulations! Thanks! 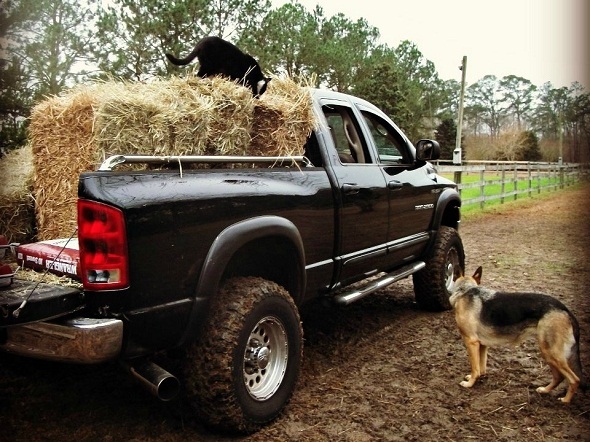 My husband was pretty impressed and I'm sure LOVES that his truck made it to the RamZone blog! I really enjoyed your post! Congrats on being a part of such a cool series! Congrats, how thrilling for you! Now I'm even happier owning a Ram Truck! Guts, Glory, Ram! Great job on the essay. Look forward to reading more as the year progresses. Congratulations, Lisa! How wonderful for you, and what a wonderful piece. Congratulations!! Makes me even happier to own our new Dodge Ram truck!! Just can't beat them and their customer service. Just in case your wondering...No, I do not work for them. Just a happy customer. Doing the happy chicken dance for you!! That is such neat news! Congrats and hugs! How exciting for you! Congrats!! I cried through that whole commercial. It still brings tears to my eyes listeing to it again!